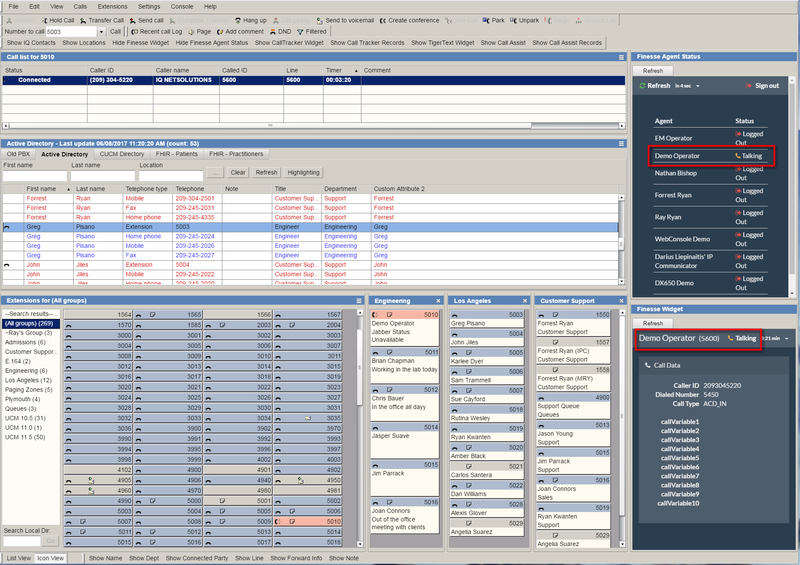 iQ’s Finesse Widget bundle consists of two Finesse Widgets that are published inside WebConsole panels. This combination provides CCX/E agents with a “Single Pane of Glass” to work in whe processing calls. The Finesse bundle is licensed for each VistaPoint Server with unlimited number of users. Finesse Agent Widget – provides a simple, easy-to-use interface for CCX/E agents to log in/out of their ACD queues and to quickly modify their availability as needed. Calling party information is displayed using variables retrieved from CCX/E. Finesse Supervisor Widget – provides a real-time view of each agent’s status. perfect tool for operators that need to transfer calls directly to specific CCX/E agents. VistaPoint Finesse widgets are HTML5-compatible and will run inside any supported browser. Best of all, they are tightly integrated with the VistaPoint WebConsole so that agents can access powerful presence and call control features when handling calls. And are automatically logged out of their queue(s) when they shut down their WebConsole. The VistaPoint WebConsole was designed to provide Cisco UCCX/E agents the ability to log in/out of their queues and have access to powerful call handling features, while also allowing for the capturing of data during the call. WebConsole will be only interface an agent ever needs. In addition to providing powerful call processing features, any number or combination of WebView “Panels” can be opened to access cloud and web-based services. These could be Finesse widgets, SMS messaging service, intranet page(s), or Jabber Chat to list a few. Panels can be displayed inside the console so that it effectively becomes a call processing dashboard, supporting drag-and-drop call processing with access to web pages, data files, third-party components, and, of course, Finesse widgets. A custom toolbar provides users with access to these features and services. We also offer add-on modules that perform specific tasks that include real-time data collection, call assistance (Code Calls, 311 services, etc), or patient/practitioner interfaces. Setup Conference calls, Join calls, park and unpark calls etc. Ready to get started with the VistaPoint Finesse Module? iQ NetSolutions is a Veteran-owned business located in Northern California. Our premier product, VistaPoint attendant consoles for Cisco, has been in use on thousands of desktops around the world since its release in 1996.